This gray-green lichen, commonly found on old trees, yields potential health benefits while also lending itself well to other industries. Bearded usnea is a lichen that grows on aging trees in forest areas across the Northern Hemisphere. The history of bearded usnea as a medicine goes back to at least 1600 BCE, when it was popular with Ancient Greek and Chinese healers. It is still used in Chinese medicine today, particularly in treatments for tuberculosis. In Europe, it is popular in commercial preparations because of its usefulness against bacterial and fungal infections, although it was not widely used by modern herbalists until a few years ago. Treating infections. Because of its antibiotic, anti inflammatory actions, bearned usnea can help fight infections, including those of the urinary tract (UTIs). Relieving bronchitis. The broad antibiotic spectrum of bearned usea is very helpful for treating the symptoms of bronchitis, lowering pain, fever, and inflammation, as well as promoting mucus excretion. Soothing skin problems. Bearned usnea has been traditionally used topically for sanitizing wounds, superficial infections, and even contact dermatitis. Additionally, bearded usnea extracts have been marketed in the United States as dietary supplements to aid in weight loss. However, their efficacy is yet to be scientifically proved. Usnea is thought to be an effective antibiotic against at least 16 known strains of bacteria, including Streptococcus and Staphylococcus. The main compound behind bearded usnea's health properties is the bitter usnic acid, which is a prominent secondary lichen metabolite, known for its immunostimulant and antibiotic properties. Usnic acid appears to inhibit the proliferation of bacteria by disrupting its metabolic function, although it does not adversely affect that of human cells. Extracts of bearded usnea have reportedly displayed significant activity against gram-positive bacteria, such as Bacillus subtilis, responsible for food poisoning; Enterococcus faecalis, which causes urinary tract infections, endocarditis, bacteremia, and wound infections; Micrococcus viradans, involved in the development of streptococcal infections and endocarditis; and Staphylococcus aureus, which can cause from minor skin infections to more serious diseases, such as pneumonia and meningitis. Additionally, in vitro studies have shown that the anti-inflammatory activity of Usnea species is comparable, and sometimes superior, to that of drugs such as phenylbutazone and hydrocortisone hemisuccinate; on the other hand, their analgesic activity has been close to that of noraminophenazone, while their antipyretic activity was equal to that of aminophenazone. Herbs like blueberry, parsley, and saw palmetto are also effective for treating urinary infections, whereas agrimony and cleavers provide similar wound healing benefits. Though it may have health benefits, usnic acid is also a suspected toxin. The Food and Drug Administration (FDA) is following up reports of liver damage as a direct result of ingesting the substance, and currently tests are being carried out to evaluate bearded usnea toxicity. 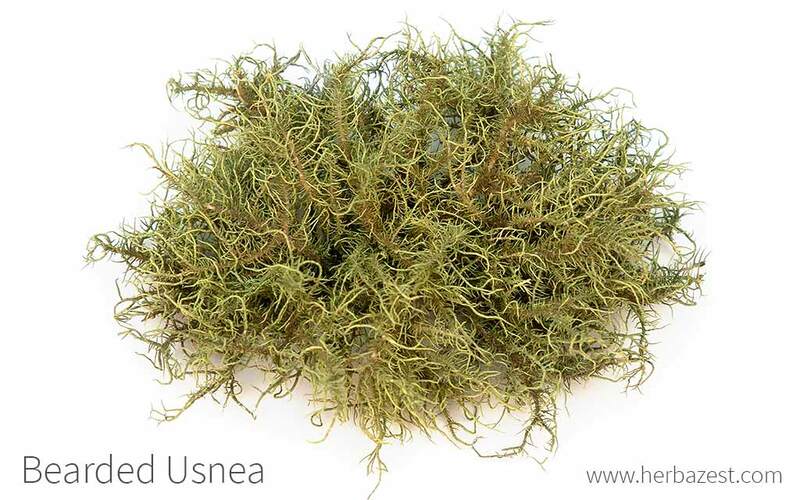 Through history, bearded usnea has been used for treating a wide range of health conditions. Nowadays, the herb can be found in medicinal forms which concentrate its medicinal benefits. Decoction. Dried usnea can be boiled and used topically, for disinfecting superficial wounds and treating eczema. Poultice. The dried liquen can be soaked in hot water and then applied directly over the affected area, in order to prevent infections. Usnea capsules and liquid extracts can be bought and consumed for health purposes, and small amounts are currently deemed safe. However, because of the potential toxicity of usnic acid, a physician should be consulted before an usnea treatment is started. Dried bearded usnea is not widely available, but sometimes can be purchased in specialized herbal stores, and through online retailers. Liquid bearded usnea extracts, as well as bearded usnea capsules, are widely available at herbal shops and online, where the product is marketed as an immune system enhancer. Care should be taken with usnea because the dose at which it produces toxic effects is not well established. Bearded usnea (Usnea barbata) is bushy lichen, which has long stems, which look like a tangled mass of threads. It is a light gray-green color, and inside, there is a white central cord. This fruticose lichen typically grows on the trunk and branches of trees and shrubs. Bearded usnea hails primarily from North America and it is a member of the Parmeliaceae, which is the largest family of lichen-forming fungi and comprises over 2700 species across 79 genera. Being a lichen rather than a plant, no varieties or cultivars of bearded usnea have been described or developed. However, there are approximately 87 species in the Usnea genus, many of which can be confused with Usnea barbata because they are similar in appearance. A few examples are U. dasypoga; U. rubicunda (red beard lichen), similar to U. barbata but red in color; and U. subfloridana, a very common lichen that is almost indistinguishable from bearded usnea. Nineteen species of the genus Usnea are currently used as folk medicines all over the world. Lichens were highly valued by the Ancient Greeks and made their way to European pharmacopeia in the early 14th century. By the late 1700s Usnea species were widely preferred for treating a variety of illnesses, from skin lesions, nausea, and diarrhea to smallpox and insomnia. A decoction of Usnea spp. was used as an anti-inflammatory and skin moisturizer. Usnic acid was first isolated by the German scientist W. Knop in 1844, but its uses were restricted to folk medicine until 1994, when it became commercially available. However, the industrial and medicinal uses of bearded usnea and usnic acid are yet to be certified by the Food and Drug Administration (FDA). Usnea has commercial importance owing to its production of usnic acid. The bearded usnea market is mainly based around its industrial uses, particularly in the cosmetic and health industry. A substantial amount of money is made each year from the use of usnic acid in antibiotic preparations and as a bactericide in certain beauty products, such as deodorant. Usnea species have long been used to produce dyes of different colors. Their antimicrobial and antifungal properties are also useful in the cosmetic industry, particularly in eastern countries such as China, Japan, Taiwan, India, and Europe where Usnic acid is formulated in creams, toothpaste, mouthwash, deodorants, and sunscreen products, either as an active principle or a preservative.